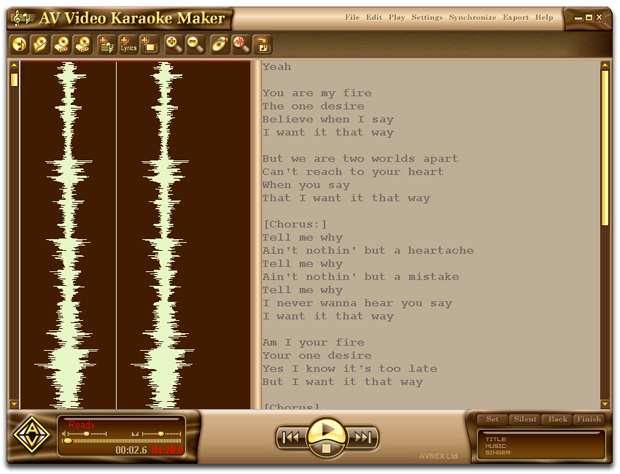 AV Video Karaoke Maker - Create your own karaoke music video in a few minutes! DOWNLOAD TIP: Having trouble downloading the needed files? Click here to see the tutorial to solve your problem. A big library of non-vocal songs you can use to make karaoke video clips with AV Video Karaoke Maker. The songs are totally free for download. Visit our community to get the songs. Thanks to this karaoke maker, I now can have good video for karaoke. Thanks a lot! This software rocks. I think this is your best program ever. I’ll suggest it to my friends to try. I love it. The program just suits my every need for karaoke making now. Share your comments about AV Video Karaoke Maker.